Urban trails are one of the best tools we have to encourage more people to walk and bike for everyday transportation, improve public health, strengthen local businesses and create a cleaner environment. That’s why we’re making the completion of the Weber Spur Trail on Chicago’s Northwest Side a top priority for Active Trans’ Chicago River Trail campaign. Suburban Lincolnwood recently built a one-mile stretch of the trail; now we’re calling on the city of Chicago to follow through on plans to build its 1.7-mile portion. The Weber Spur is a 2.7-mile trail that starts at Touhy Avenue in Lincolnwood, takes a southwestern route through LaBagh Woods and connects to Elston Avenue’s bicycle lanes (see map). This trail will create the ultimate low-stress connection for people biking and walking between the North Branch, Sauganash and North Channel Trails. 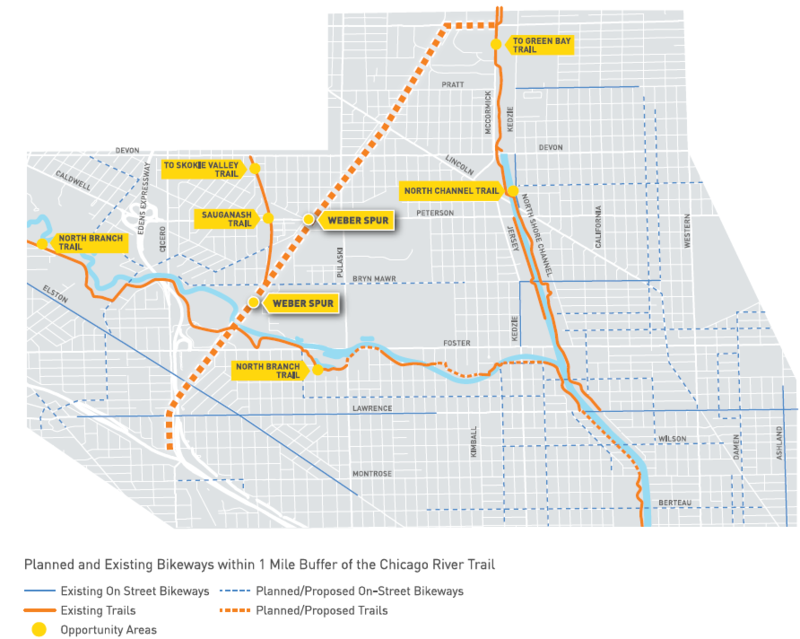 “The Weber Spur will connect the North Branch Trail to Elston’s bike lanes and would bring more city folks to the beautiful LaBagh woods, essentially creating a green corridor along the river all the way to the Chicago Botanical Garden,” said Iliana Genkova, a leader of the North Branch Trail Alliance. Residents and elected officials have clamored for this connection for more than nine years since Union Pacific Railroad removed its tracks. After an initial burst of planning activity, development has remained in limbo despite overwhelming community support for the project. Along the way, Active Trans and our members have been heavily involved in pushing for the Weber Spur Trail. Our members provided input at an initial planning meeting in Albany Park in 2015. Last year we organized a trails workshop at Gompers Park with Alderman Laurino during which residents identified the Weber Spur as a top local priority. We also noted that many neighborhood voices called for the trail during a planning session led by the Chicago Metropolitan Agency for Planning. Recently, we started to work closely with public health students from the University of Illinois-Chicago who are conducting health impact assessment of the trail. (Please click here to complete a survey just released by the students.) The health impact assessment will provide insight into the specific public health benefits the trail project will bring to surrounding communities. Despite all these efforts, the project has stalled at a critical time when related projects like the North Branch Extension have been completed and construction has started on other river trail segments. But we know persistent advocacy and mobilizing will ultimately yield results. Want to add your voice to those calling for the Weber Spur? Click here to join the Chicago River Trail campaign.